Not being able to have the Kindle Fire in the UK, I never heard anything about this? Is this true, do any 3MY fans in the US have this problem? After making such a furore by signing their most popular hundred graphic novels exclusively to the Kindle Fire last year, and seeing Barnes & Noble and Books-A-Million boycott those titles in protest, you’d have thought that DC and Amazon Kindle were tight as could be. It appears not. DC Comics can no longer be found in the Kindle Fire ComiXology store… and may not have been since November last. You can still buy them on ComiXology through your PC and then sync them over, but you can’t find them anywhere in the Kindle version of the app. The DC section of ComiXology has been removed completely. Basically, there’s a workaround. But something seems to have happened between Amazon Kindle, DC and ComiXology, and after spending a couple of months trying to find out what, no one’s talking right now. Or rather Amazon reps say they don’t know, ComiXology says they can’t say and DC Comics doesn’t say anything at all. 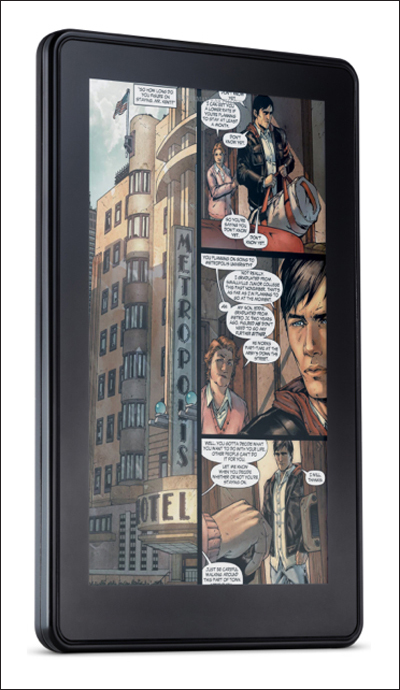 via What’s Up With DC Comics, ComiXology And The Kindle? | Bleeding Cool Comic Book, Movies and TV News and Rumors.